Carpet market is directed under circular economy, where immediate action is needed by carpet manufacturers, public authorities, municipalities, consumers and retailers towards the carpet recycling as they are 100% recyclable. In Europe 95-97% of used carpets are either dumped into landfills or burnt in incineration. The remaining 3-5% recycled carpets are of inferior quality, and cannot be further recycled at the end of its useful life. There is no huge market for carpet recycling, but because of the need there is an opportunity for new companies to enter into the European carpet recycling market. 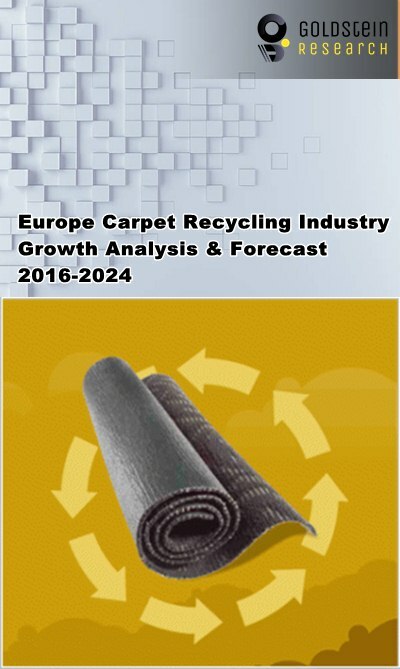 Goldstein Research analyst forecast the European carpet recycling market size is set to reach USD 13.31 million by 2024 from USD 8.4 million in 2016, growing at a CAGR of 5.9% over the forecast years. The developed reverse logistics, designing of the carpet at the time of manufacturing, and the government initiatives impacts the carpet recycling market. The report covers the present ground scenario and the future growth prospects of the carpet recycling market for 2016-2024 along with the statistics of the total carpet available for recycling. We calculated the market size and revenue share on the basis of revenue from sale of products made of recycled carpets by the major players. On the basis of material, Products made by recycling carpet’s material PET such as making new carpet, that have the 20% share of all the recycled products, are of highest grade polymer, strengthen the fiber and are stain resistant. Other applications of carpet recycling are also made of superior quality as the material used while making carpets were of good quality. Carpet recycling market outlook 2016-2024, has been prepared based on an in-depth market analysis from industry experts. The report covers the competitive landscape and current position of major players in the carpet recycling market. The report also includes porter’s five force model, SWOT analysis, company profiling, business strategies of market players and their business models. Europe carpet recycling market report also recognizes value chain analysis to understand the cost differentiation to provide competitive advantage to the existing and new entry players. According to the report, major driving factor for the growth of carpet recycling market is increasing the municipality recycling capacity by technology change and annual increase in carpet demand, which impacts the waste carpet available for recycling. Yearly there is 1.6 million ton used carpet out of which 1-3% carpets are recycled. Further, the major challenge for the carpet recycling market is to bring carpet market into circular economy. The designing of the carpet while manufacturing, the material being used, combination of materials in each layer, adhesive being used to bring the material together, determines that the carpet or the part of the carpet can be recycled or not. Therefore the recycle process will vary as per design of the carpet and this may escape the circular economy of carpet market. Demand for carpet in 2016 generated the revenue of USD 55.16 billion. Belgium exports 96% of their carpets manufactured, and is the second largest carpet manufacturers. Germany and France are also big manufacturers of carpets. 400,000 tons of carpets are discarded annually from the Germany. As the growth of carpet market is expected to grow 2.7% annually and out of the total carpets sold 1-3% carpets are reclaimed for recycling, it is expected the carpets claimed for recycle will also grow accordingly due to the necessity of decreasing landfills and inclusion of circular economy. Europe carpet recycling market report comprises of the following companies as the key players in the carpet recycling market: Interface, Desso, Waste to Energy b.v, Greenstream Recycling, Spruce Carpets, Emerald Trading Waste Solutions Ltd, Griffiths Waste Management, Park N Load. Other high-flying vendors in the carpet recycling market are: Potters Recycling, Seneca Resource Recovery, Teprac GL Ltd, James Robinson Fibres/Texfelt Ltd, Econpro WDS Ltd.
What is the revenue of carpet recycling market in 2015-16 and what would be the expected demand over the forecasted period?